We are always on the lookout for skilled and dedicated home visit vets in the UK. If you are a qualified veterinarian and want to start helping people and pets in your part of the country, we want to hear from you! ''When I heard of the idea of a national team of vets who would specialise in home euthanasia and end of life care I was very excited. Over the years I have carried out many home euthanasias and have always strived to help people in a compassionate supportive manner. I feel great satisfaction when I see through compassionate communication with the grieving pet owners that a troubling time can be made more meaningful and healing for the individuals involved. 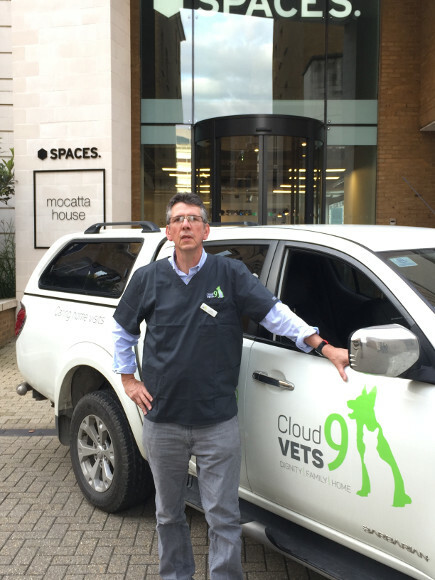 I can see that Cloud9 is the ultimate way of ensuring that everyone can have the option of a dedicated 'end of life' veterinary surgeon visiting there home and performing a gentle painless pet euthanasia. For the pet owner there is complete emotional support throughout the whole painful process of the loss of a beloved pet. For the pet there is a stress-free gentle escape from the pain and suffering that the animal is experiencing. The animal is relaxed and free of anxiety in the sanctuary of it's own home. The approach of the vet in taking time and minimising the clinical nature of the euthanasia means that many animals are not aware that there is a vet in the house. You choose the days and times when you want to be on call. just a few hours or several days - whatever fits your preferred schedule. We book clients by managing the sophisticated Search Engine Optimisation, so all you need to do is turn up and do what you do best. You invoice us for providing your veterinary services every 14 days - simple. We save you money thanks to our deals with the top suppliers in these and other areas. You can supplement your normal working week by working outside of normal hours - our services are provided round-the-clock. We offer an introductory drop-in day if you just want a little more information about becoming one of our Associate home visit Vets. I consent to having Cloud 9 Vets collect my personal data. Abel's unexpected passing was difficult enough, so to do away with the worries of how to care for him afterwards was a real godsend. We called very late at night but they still sent someone - it did cost a little more because we hadn't registered but I would pay more for a service like this. Learning to say goodbye to Socks and Mittens took a long time but I am grateful to Jeremy for the ongoing visits and care he provided. The advice and tea and chats we shared about how they'd be feeling in themselves made it easier to understand. I really can't thank him enough.